While the history of the Bellini is as clear as a glass of Prosecco, that of the Spritz is much like that of Venice -- colorful and mysterious. Cocktails much like the Spritz are common in parts of Austria, so most agree that the Spritz owes its origins to the Austro-Hungarian influence on Venice. After walking Venice’s cobbled calles, ducking into museums and ogling her glass shops, nothing is more refreshing than the Spritz. Generally consumed as an ombra (a pre-dinner drink beginning about 5 pm in Italy), a Spritz is also the preferred fisherman’s late-morning cocktail, so don’t be shy about ordering one before lunch. However, when you do plunk down in that cafe and ask for a Spritz, your bartender will then ask, “Aperol or Campari?” Roughly speaking, the Aperol version of the cocktail is sweeter and is considered more feminine while the Campari version bespokes Venetian machismo. 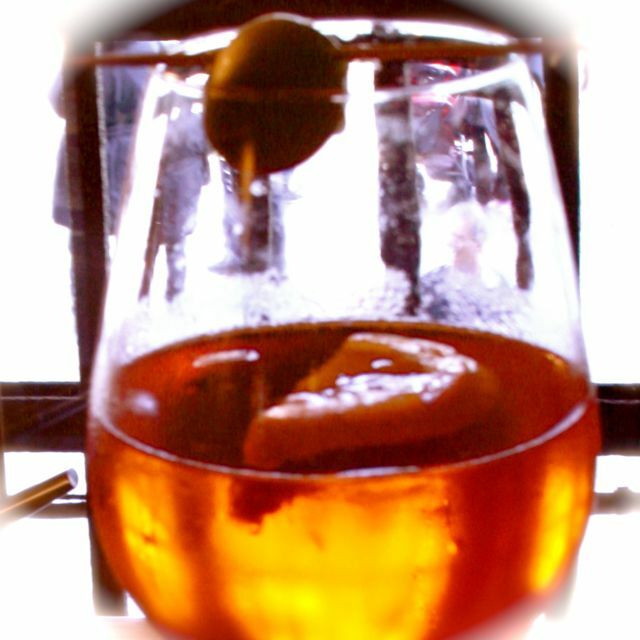 Both Aperol and Campari are versions of bitters, and their tastes are each distinctive. Me? I’m partial to Aperol, but the Campari variety has its charms as well. Every bar in the city serves a version of the Spritz. Place 3-5 cubes of ice in a cocktail glass (a double old-fashioned or martini glass work well). Pour in 4 oz of Prosecco. Top with a splash of sparkling water. Add a splash of Aperol or Campari. Add the fruit slice to the glass. Spear the green olive with a toothpick and balance on the top of the glass as a garnish. Note: Adding the ingredients in order is key with the Spritz. Otherwise the Aperol or Campari may not mix well with the other liquids, and since both Prosecco and sparkling water are bubbly, you don’t want to stir much. The result: a drink that’s bubbly, slightly bitter, and fruity all at once. Where can you find a Spritz? Anywhere. Most bars and cafes serve them. I enjoyed one at Caffe Vergnano in the Mercati di Rialto. The little cafe has a nice selection of pastries, seating both inside and out, and is a charming place to sit for awhile after a busy morning at the fish market. There are no real rules when it comes to a Spritz. After all, every bar in the city makes their version of the cocktail with a slightly different mix. Finding your favorite could turn into a delightful quest. Want to know more about Venetian cocktails? Do you have a favorite place to enjoy a Spritz?